Cameron Maybin only had 13 hits - including the postseason - for the Astros in 2017. Four of them were home runs. Fiers was a fine back-of-the-rotation guy and let's not forget that Fiers stepped up mid-2017 when Keuchel, McCullers, Morton, and McHugh were all on the DL. In ten starts between May 30-July 21 Fiers threw 61IP, 43H/16ER, 69K:21BB, a 2.36 ERA/1.05 WHIP. Despite that 10-game stretch of brilliance, Fiers ended 2017 with a career-worst 5.22 ERA (I'm not counting his eleven games with Milwaukee in 2013). Fiers was inconsistent, at best. Ultimately, Fiers' final game was ugly: 3.2IP, 10H/8ER, 5K:1BB on September 13 at Anaheim. Luis Valbuena took him deep for a 2-run 1st inning home run, which Valbuena predictably bat-flipped. Next Valbuena plate appearance saw Fiers throw over Valbuena's head (Valbuena would get a double later in the AB), which resulted in a 5-game suspension that Fiers did not appeal. He didn't pitch for the Astros again. On a related note, remember that Brett Oberholtzer threw at A-Rod in June 2015, got ejected, and got sent to Fresno after the game. He made one more start for the Astros and then was traded to Philly for Ken Giles later in the offseason. This has sort of been a theme, albeit with some exceptions - Lance McCullers comes to mind - in which a pitcher who intentionally throws at/near a batter gets (wait for it...hold...HOOOOLLLD) fired. Fiers was projected to make $5.7m in arbitration this season, $800,000 less than Jose Altuve. Fare thee well, Mike Fiers, you held it down when the Astros really needed it. So that's about $32m coming off the books for 2018. We'd certainly be interested. Based on everything our guys have seen, he's got really good stuff and he could be a top-of-the-rotation pitcher, and he's got a bat. We need a left-handed DH, so there you have it. Take a moment to breathe into a paper bag. Reports are that Ohtani is in Los Angeles and could begin interviewing teams next week. The deadline to sign him is December 22. Jon Paul Morosi reports that Ohtani will be looking for opportunities to pitch and hit. Eno Sarris notes that keeping Ohtani healthy will be a key recruiting point and, even after the Rotation Wreck of 2017, the Astros rank 2nd overall in a composite DL study. *Jon Heyman's "Inside Baseball" notes consist of hard-hitting insider information regarding Dallas Keuchel switching agents, and organization-wide disappointment after the Not Events of July 31. *Former Astros Great Aaron Boone is the new manager of the Yankees. *Former Astros Great Asher Wojciechowski signed a minor-league deal with Baltimore. *YEAH JEETS: The Marlins fired a hospital-bound scout days after he had surgery for colon cancer and who is also awaiting a kidney transplant. As far as Yuli and sensibilities regarding Asian players, I'd bet that there are plenty of Japanese players that can give Ohtani direct feedback on Yuli. I'd bet money that in most international dugouts this was a non-event and that it was exclusively an American sensibility freakout. That doesn't make it right...it's just the context of the culture, baseball and what goes on in dugouts and clubhouses around the world that makes that moment "my little pony" moment by comparison to the debauchery that goes on otherwise. I left out the backdrop that Yuli played in the Japanese league and developed those relationships. I know there isn't a ton to write about, but I feel this Ohtani excitement is overblown. More or less every team is going to make a "full-court press" for Ohtani. He has too much value not to. These other teams will not begin the 2018 season with a starting 1st baseman suspended for racially mocking a Japanese pitcher. If esteemed fellow commenters want to speculate that it's not a factor for Ohtani, a Japanese pitcher, fine. I'm going to speculate it probably means something to him. Of course I hope everyone else is right & I'm wrong. Look... it's impossible to know what Ohtani thinks of Yuli's actions. 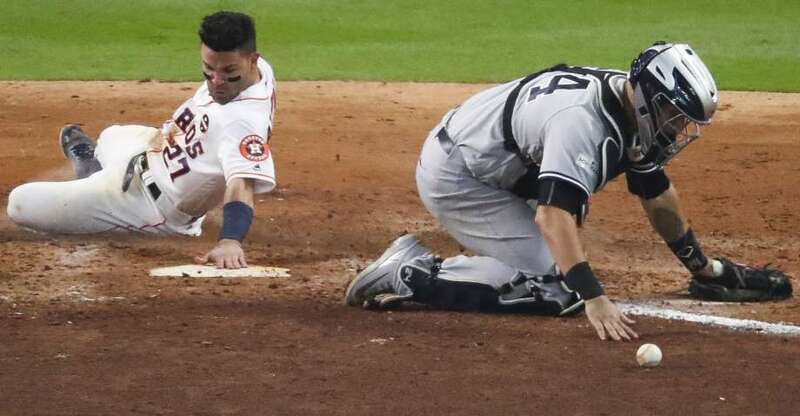 We all know what a good guy Yuli is, how much he contributed to our Championship, and how much he means to all the other Astros players. It doesn't make what he did right... it was incredibly thoughtless and immature.. however I forgive him, I think most Astros players and fans forgive him and know he's not like that... and thought he ate plenty of Humble Pie and tried to fix it. No one knows what Ohtani is going to be in the Bigs. He looks like a plus pitcher, probably not so much at the plate. It would will be fun to watch him, and I hope he chooses to come to Houston as I know he will be happy with that choice for all kinds of reasons. If he chooses otherwise... well, no big deal.